The Sharkadina Blog: DEUCES WILD! SHARK TIME! No, it's not a sequel to Outkast's Idlewild (although that would be awesome, too)... It's even better!!! Roger "The Shark" Bernadina dominated today. And the Nats did pretty good too! Two was today's magic number. Twos were wild for Syracuse tonight! Roger Bernadina brought his A+ game to Pawtucket. While batting second in the Chiefs lineup, the Shark had a walk, 2 singles, 2 stolen bases, and a run scored (which was the go ahead run in a tied game). Defensively, the Shark was a killer as well, doubling the PawSox's CF off at first for an impressive and important two outs in the 8th. Some other players did alright as well (a couple 2-run jacks were hit), but Bernadina was definitely the Player of the Game, the table setter for the Syra'twos'(yikes) victory. He won Shark of the Game too, but he wins that every night. Unable to use the "Black Magic" they had used in the previous games, the PawSox fell victim to the Shark's powerful jaw and succumbed to losing. Final score 6-3. Washington played 2 games today making up for yesterday's rained out game. In the first game, even though they didn't score any runs in the 2nd inning, they scored 1 in the 1st and 6 in the 3rd (a second inning sandwich)! Second baseman, Danny ESPinosa led off today and had a great game, collecting 3 hits and scoring 2 runs (he's now batting .292 on the season). The Nats only had one double but they had 2 stolen bases (the same number that Bernadina had himself...) Even though they were playing without the Shark, #2, they managed to win 8-6 (won by 2 runs... hmm...). RicK AnKiel (with the 2 Ks in his name) had no strike outs in the game, but managed to be picked off in the game, which combined with a caught stealing earlier this season, that is his second unnecessary out of the year. The second game was not quite as successful. Jordan Zimmermann (the one with 2 n's) gave up 5 runs in 6 innings. Mako Morse went 0-4, dropping his average to .186. Ian Desmond had an error, his fifth on the season (and second of the day). The Nats only managed 5 hits on the day and fell 5-3 (another 2 point spread). 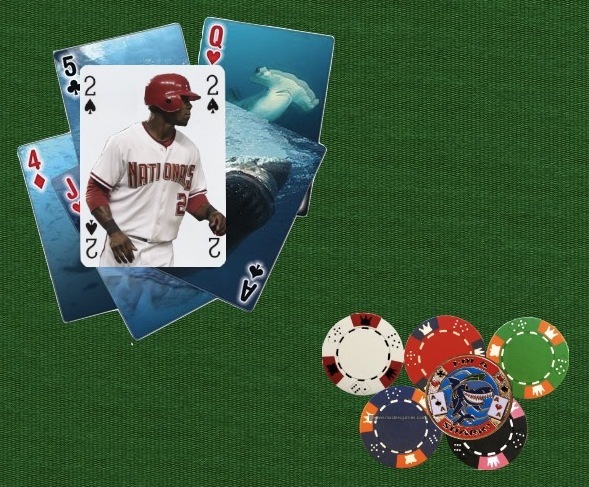 They could have definitely sharked up and used The Shark in this second game of the day. Moral: Bernadina is the Nationals pocket aces (which adds up to two). Promote the ShAAArk! !